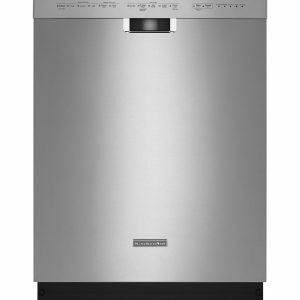 This dishwasher features stainless steel almost entirely, inside and out. 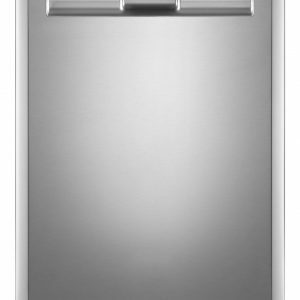 The exterior features a fingerprint-resistant finish, and the interior tub is made of stainless steel. Stainless steel tubs can handle higher heats, and they last for years to come. There’s also a 4-blade stainless steel food chopper. The 4-blade stainless steel chopper disintegrates food particles that come off dishes so they don’t end up recirculating and sticking to dishes and glassware. The roomy lower rack holds a full-length silverware basket, and the upper rack is height adjustable. The upper rack also features a fold-down cup shelf. With multiple wash cycles, the PowerBlast™ cycle removes stuck-on food with high pressure spray jets, increased temperature and hot steam to finish the job. 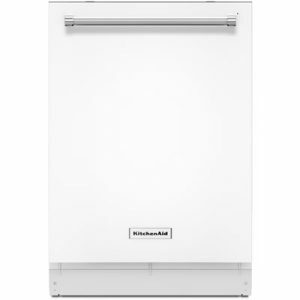 Other cleaning options include high-temperature washes, and a delay start to ensure that the dishes get washed at the end of the day. 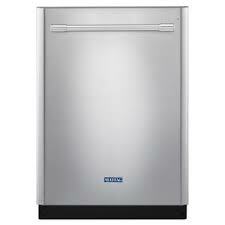 Maytag dishwashers feature the most powerful motor on the market. Powerful enough to handle dried-on egg yolk and peanut butter without pre-rinsing, this motor can handle your dirtiest dishes. The 2X Life tested motor is built to last and tested to prove it. Twice life testing based on accelerated 20-year life testing, normal cycle, average use. No more scraping plates. The 4-blade stainless steel chopper disintegrates the food particles that come off your dishes so they don’t end up recirculating and sticking to your dishes and glassware. 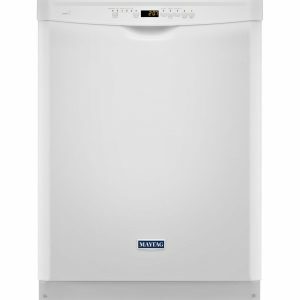 The easy-to-clean, Fingerprint Resistant Stainless Steel exterior keeps your dishwasher looking as good on the outside as it works on the inside. The industry-exclusive stainless steel silverware basket is built tough to handle whatever you throw at it.